Authors: Mikheeva T.T., Zinkovskiy S.B., Lapo P.V., Grafshonkina A.A.
On March 30-31, 2018, the I International Scientific Conference “Law as a Phenomenon of Civilization and Culture” was held at the Law Institute of the Peoples' Friendship University of Russia (hereinafter - RUDN). The event was co-founded by the Federation Council Committee on Constitutional Legislation and State Building of the Federal Assembly of the Russian Federation. I. CONFERENCE FORMAT This scientific event was a logical continuation of a scientific conference in the “Zhidkovskiy readings” format, initiated in 2006 at the Law School of the RUDN University (now the Law Institute of the RUDN University) and dedicated to the memory of the outstanding representative of the Russian historical and legal science O. A. Zhidkov (1931 - 2005). Over the past period, the event under the conditional title “Zhidkovskie readings” was able to unite hundreds of scientists engaged in research in the field of theory and history of law and the state, methodology of legal science, legal comparative studies, other fields of legal science, and became a real platform for scientific discourse, search for new ideas and approaches, clearly identified the key focus of the conference related to the knowledge of law as a phenomenon of civilization and culture. These circumstances led to the choice of a new format of the conference, aimed at integrating Russian jurisprudence into the world scientific space, substantiating the civilizational and cultural foundations of law. According to the organizers, the new name of the conference - “Law is a phenomenon of civilization and culture” - not only designates the perception of fundamental legal problems, outlines trends in the development of law in retrospect and the current state, but at the same time reflects the uniqueness of RUDN as an internationally-oriented university, currently students from 154 countries study. An international conference with the stated name is planned to be held annually. At the same time, the “Zhidkovskie readings” format is intended to be retained by the organizers as one of the working sites of the conference, at which meetings with eminent jurists who brought in the same way as O. Zhidkov, an invaluable contribution to the development of the domestic legal science. II. PROGRESS OF THE CONFERENCE The first international scientific conference “Law as a Phenomenon of Civilization and Culture” held on March 30-31, 2018 (full-time and part-time) was attended by more than 200 researchers, including: 126 doctors and candidates of juridical sciences, 74 graduate students. There were 128 scientific reports, 29 of them by doctors of juridical sciences. The conference participants represented 73 educational and scientific institutions from 21 constituent entities of the Russian Federation, as well as foreign countries: Barbados, Belarus, Kazakhstan, Kyrgyzstan, Lithuania, the Transnistrian Moldavian Republic, Tajikistan, the United States, Ukraine, and Finland. On March 30, on the first day of the conference, a plenary session and five thematic sections were held: 1) “Formation of ideas about law as a civilizational and cultural phenomenon”; 2) “Translation of legal experience: traditions and innovations”; 3) "Sociocultural dimensions of law"; 4) "The space of comparative legal research"; 5) "Interaction in the law of national and universal." On March 31, the second day of the conference, a round table discussion entitled “Trends in the Development of Legal Science: Theory and History of Law and the State; methodology of legal research "and the School of Young Scientists was held, within which two sections were organized: 1)" Studies in the field of the theory of law and the state, branch of legal sciences "; 2) "Studies in the history of law and state, comparative law." The School of Young Scientists, where, under the guidance of well-known professors, there was a discussion of the research results of graduate students and young teachers of law schools, the participants recognized as a very productive and promising format of work. III. BRIEF (ANNOTATED) CONTENT REPORTS OF THE PLENARY SESSION The plenary session of the conference was opened by the report of the Chairman of the State Duma Committee on State Building and Legislation, the co-chairman of the Association of Lawyers of Russia, Doctor of Juridical Sciences, Professor P.V. Krasheninnikov "Silver Age of Law." The author's vision of the views of prominent Russian scientists of the late 19th - early 20th century was presented, when the “silver age” began in jurisprudence (as in poetry, philosophy, other areas of spiritual activity). Critical views and reform ideas of Russian lawyers were aimed at finding goals and ways to change the Russian state, society and law. "Silver Age of Law", represented by such names as V.S. Soloviev, E.N. Trubetskoy, S.A. Muromtsev, G.F. Shershenevich, L.I. Petrazhitsky, P.A. Sorokin, N.S. 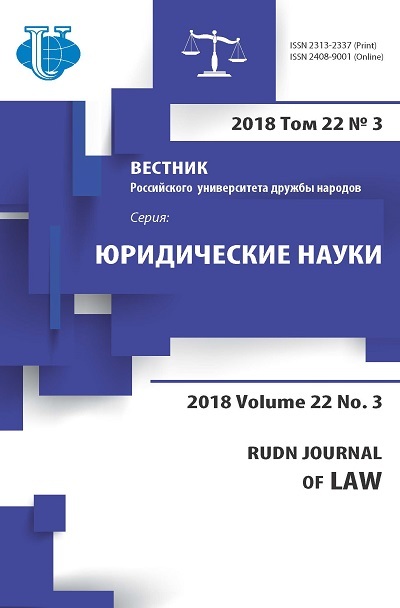 Timashev, G.D. Gurvich et al., Has a significant influence on the development of Russian law not only of that era, but also of subsequent periods. According to the speaker, the “silver age” in Russian law and jurisprudence became a natural continuation of the “golden age”, a bright representative of which was MM. Speransky, who initiated in the first half of the nineteenth century. colossal codification works to compile the Complete Collection of Laws and the Code of Laws of the Russian Empire. Professor of Department of Theory of State and Law of V.Ya. Kikot’ Moscow University of MIA of Russia, Doctor of Juridical Sciences, Professor V.P. Malakhov, in his report “Discrimination of law in its cultural and civilizational dimensions as a methodological task,” focused on the distinction between social, cultural and civilizational dimensions of law. Law as a social phenomenon is a normative education; it is not only a consequence of social processes, but also their basis; the dominant form is state law; dominant is legal and sociological legal thinking; right exists in the historical scan. In the cultural dimension, the basis for law is a person who appears as an individuality, and not a feature; the right is that which does not change under the influence of reality and, in accordance with it, is itself unable to change reality; the dominant form is customary mass law; anthropo-axiological legal thinking prevails; the right settles in the tradition, the parable, in the moral of the law. In the civilizational dimension, law acts as an extremely general background of the life of society; the dominant form of law is natural law; archetypal legal thinking is adequate; the right settles in the sacred as in the ultimate state of spirituality. The report of Professor V.P. Malakhov formulated the conceptual idea that the development of society and the state is subject to one pattern: it goes from civilizational and cultural to absolutization of the social in the state, law, society, consciousness; the orientation of the theory of law is also the same. Professor of the Department of Theory of Law and State at the Law Institute of the Peoples' Friendship University, Doctor of Juridical Sciences, Professor N.A. Vlasenko made a presentation on “Liberal thinking and the development of the theory of law”. According to the speaker, liberal thinking has its historical roots and goes back at least to the 19th century, and owes its origin to the French and English bourgeois revolutions. The initial stage of the liberal bourgeois ideology denied such values as religion, marriage, the state and some others. A new stage in the development of legal ideology (the second half of the 19th century - the beginning of the 20th century) was characterized by an orientation towards such values as public authority, parliamentarism, the rule of law, legal forms of marriage, etc. The current stage of bourgeois thinking and its ideology are called “market” characterized values such as freedom of the market and services, digital rights of citizens, etc. However, the modern Russian theory of law does not always take into account the phased development of liberal ideology and often focuses on the ideas and values of the past, which are an attribute of a specific historical stage in the development of society. Freedom of scientific creativity, gained by Russian scientists in the 90s. The twentieth century, often used to rethink the role of dialectics in the knowledge of law and its key characteristics, essence, sources, etc. Such “methods” of research of legal reality as hermeneutic, synergistic, integrative, paradigmatic, phenomenological, etc. are proposed and often absolutized. However, the effectiveness of the new methodology is extremely small. The achievements of the domestic legal science cannot be pushed aside. It is not only about the methods of legal science, but also the defining characteristics of law, such as normativity, genetic and functional connection with the state, the conditionality of human practice (economics, politics, interest in science, etc.). Excluding or ignoring any of these essential signs, as rightly notes A.F. Cherdantsev, turns the law into something else. Deputy Director of the Institute for Problems of an Effective State and Civil Society of the Financial University under the Government of the Russian Federation, Doctor of Juridical Sciences, Associate Professor K.E. Sigalov, in a report on the topic “Time in mastering the right of society”, said that the correlation of law and time is due to the positioning of both categories in the social sphere and these are unconditional conjugate values. Where time is highly valued, right is also highly valued, the speaker noted. Primitive peoples hardly understood what the future is, they have not yet developed ideas about planning and foresight, which is also due to the original methods of normativity. Morality, custom, ritual are focused on the past, which "subordinates" the present. The right is focused on the future, which is based on the present and the past. Further, the speaker made a brief retrospective analysis, showing how the factors of civilization and culture influence the development of law in time and space. If for the ancient Greeks the “golden age” was in the past, they did not transfer the dialectics they had born to the concepts of progress, the Romans distinguished the close and distant past, perceived the linear picture of the world, their state-political doctrine was oriented in time. Time in the Western European medieval understanding of the world was the moment of eternity, belonged to God, it was considered a sin to master it. Roman private law was due to a change in property relations, subject to the formation of personal rights. The code for the development of European civilization was correlated with agricultural management algorithms, intensive production technology, and the direction of development was linear. At the same time, the code for the development of Muslim civilization was due to the nomadic management algorithms, extensive production technology, aggression, and an internal oasis-steppe conflict. Hence, the sinusoidal direction of development, when the periphery verifies orthodoxy, conservatism, and the rejection of innovations. The passage of time, accuracy, binding nature and the contractual nature of the relationship were not Muslim values. The traditional attitude of the Hindus indifferently treated the temporal and eventual aspects of life, being engaged in infinity. In the Indian literary monuments there is no information about social conditions and political events, the accuracy of time is not valuable. Closed space and cyclical time - this is the model of traditional Chinese sense of justice. Historical time received personal names associated with the life of emperors or dynasties. The future was considered not as something ahead and still unrealized, but as already being. Thus, morality hung over the law. Further, the speaker focused on the peculiarities of the Russian legal consciousness, which are based on the cairological perception of law, responsibility and retribution in a historical perspective. Kairos draws the attention of a person to a favorable moment of activity. It is not accessible to everyone, but only to exceptionally gifted individuals or social forces noted above. The report of the head of the Department of History of Law and the State of the Law Institute of the Peoples' Friendship University, Doctor of Juridical Sciences, Professor M.V. Nemytina, “The Multidimensional Space of Legal Culture”, spoke about the difficulties experienced by Russian law in connection with its departure from the formation approach and the search for other methodological grounds and explanations for the development of law, society, and the state. Law in all its diverse manifestations and forms of existence is a phenomenon of civilization and culture, reproduces itself, accumulates legal experience. According to the speaker, an understanding of the course and development trends of human societies as civilizations, combined with ideas about culture as an evolutionary experience with traditions and innovations, today define the paradigm of cognitive activity in the social and humanitarian fields of knowledge, including jurisprudence. Law as a phenomenon of civilization and culture coexists and reproduces together with other social phenomena (politics, economics, language, psychology, ideology, art, etc.) and is difficult to separate from them. By virtue of this, the legal life of a society, if it is viewed as law understanding, lawmaking, law enforcement, use of law, is subject to the influence of a variety of factors. The key directions of scientific research in the field of law, their vectors, are socio-cultural, cultural, civilizational and cultural. At the same time, it should be taken into account that, from the perspective of modern scientific knowledge, the approaches to mastering social reality and the limits of its comprehension are such that it makes it difficult to establish common laws for the development of law in civilizations-cultures and society. It seems possible only to identify with a certain degree of probability trends that are characteristic of civilizations and cultures in their past, present and future. The civilizational and cultural foundations of modern Russian law are heterogeneous and represent an eclectic mixture of various civilizations-cultures in diachronic and synchronous sections. These are elements of the legal system of pre-revolutionary Russia, Soviet law, international law, Western law, and Eastern law. The report "The legal factor in the dynamics of social trauma: the Russian experience" was made by the Head of the Department of International Law of the A.I. Herzen Russian State Pedagogical University, Doctor of Juridical Sciences, Professor A.A. Dorskaya. Summarizing the different opinions about the concept and nature of social trauma, she highlighted the most important characteristics of this phenomenon. The stages of the emergence, development and overcoming of social traumas, developed by the Polish sociologist P. Sztompka, were reviewed using the example of Russian historical and legal material. Various examples from the history of the state and law of Russia were given, showing the significance of the legal factor at different stages of the transformation of social trauma. Attention was drawn to the fact that law as a universal social regulator can act as a preventive tool that can prevent the occurrence of social trauma, and can also help to prevent certain events from being perceived as traumatic. L.O. Murashko, Doctor of Juridical Sciences, representing the Constitutional Court of the Republic of Belarus, in her presentation “The Digital Dimension of Legal Space in Modern Conditions” dwelled on the current issues of digitalization and the changes that this process brings to all spheres of life. The law needs to respond to the challenges of a rapidly growing digital economy, which, along with globalization and transnational regulation, is changing the perception of such global categories of humanity as space, time, and communication. Thanks to digital technologies, the world is accelerating and objectively universalizing, which requires flexible universal legislation in existing branches of law and fundamentally new legislation for the “customary” legal regulation of entire sectors of the digital economy. It becomes obvious that in the case of digitalization processes, the “leading reflection” of the law is significantly delayed, and without a murmur it follows the development of technologies that rely at the beginning of their journey on self-regulation. This places increased demands on the legislator, who has lost the habit, at least in countries with stable traditions of statism and positivism, to carefully and thoughtfully explore the emerging customs and usages, to envelop objectively developing relations in the normative legal form. Thus, digitalization processes bring to the fore the issues of borrowing “best practices”, samples, successful algorithms of legal mechanisms, which, being created in one legal system, are adopted by other states of the world and adapt to different legal conditions, often contrary to established legal traditions. The report noted that in the Republic of Belarus much attention is paid to the development of information technologies, a number of documents have been adopted, including the State Program for the Development of the Digital Economy and the Information Society for 2016-2020. According to the rating of the International Telecommunication Union, Belarus ranks 36th (out of 167) in terms of the development of information and communication technologies and is a leader among the CIS countries. The current changes in the legal regulation of Belarus in the field of digital technologies now include the entry into force of the Decree of the President of the Republic of Belarus of December 21, 2017 No. 8 “On the development of the digital economy”, which was developed largely due to the efforts of the “information community” that is emerging within the High-Tech Park (HTP). The main provisions of the Decree concern, in particular, the comprehensive legal regulation of businesses based on blockchain technology. This creates a favorable legal regime for the development of the national economy. Director of the Law Institute of the RUDN University, Doctor of Juridical Sciences, Professor O.A. Yastrebov in the report “Modern requirements of the Higher Attestation Commission on awarding academic degrees” told the participants about the problems and prospects of Russian legal science, the need to improve the quality of training of scientific personnel, the latest trends related to the creation and organization of dissertation councils in universities that have the right to award academic degrees. , in the number of which entered and RUDN. The speaker also focused on the problems of raising the level of scientific legal journals, including them in international databases. In conclusion, he expressed confidence that all measures taken would contribute to the development of Russian legal science, its integration with foreign science, and the improvement of international cooperation in the field of law. IV. CONFERENCE RESULTS In summing up the results of the I International Scientific Conference “Law is a Phenomenon of Civilization and Culture,” its organizers and participants noted how difficult it is to solve problems of such magnitude and complexity as the civilizational and cultural foundations of law under the conditions of pluralism of modern national jurisprudence. At the same time, they came to the unanimous conclusion that the discussion among specialists of the problems stated in the conference title outlined the correct development vectors in the field of legal science based on modern methodology. This allows you to identify trends in the development of society, state and law in different historical periods, to discuss the problems and prospects of modern law and jurisprudence in Russia and foreign countries. Copyright (c) 2018 Mikheeva T.T., Zinkovskiy S.B., Lapo P.V., Grafshonkina A.A.